1.Clamp for the horizontal lifting of "H", "I", "T", "L" shaped structured steel. 2.Loading range: 1ton to 3ton. 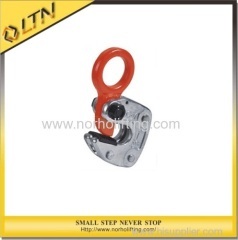 3.From a machanics point of view, these clamps have ideal designs, which are compact, light weight, easy to use. 4.Multi plates can not be lifted. only lift one piece of clamp one time. Up the lock lever to tighten lock spring when it under loading. 5.Down the lock lever to loose lock spring, When you could unload. 6.The loaded object shall not touch anything when operating, over loading is prohibited. 7.Testing load is 2 times of working load. 8.The main body and parts are made from die-forge special alloy steels, which are optimally tempered for maximum strength and durability.